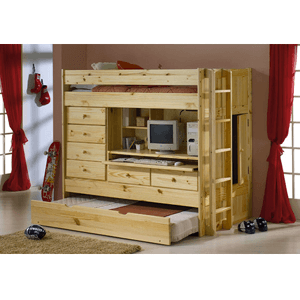 All In One Solid Pine Wood Loft Bed. Great Loft For Students. Features Computer Work Station, Shelves And 18 In. deep Computer Tray, Seven Drawers, A Side Wardrobe, Adjustable Hutch Shelf, Rear Storage With Door Access On Both Ends, And A Roll Out Under Bed. Available In Full And Twin Sizes. The Twin/Twin or Full/ Twin Comes in Natural Lacquer or Cherry Lacquer. The Full Comes only in Natural Lacquer. Easy To Assemble. Strong Construction. Price Includes Slat Kit for top and bottom. Twin Over Twin Size: 65-1/2 In. (H) x 42.5 In. (D) x 84 In. (L) Includes the Ladder.